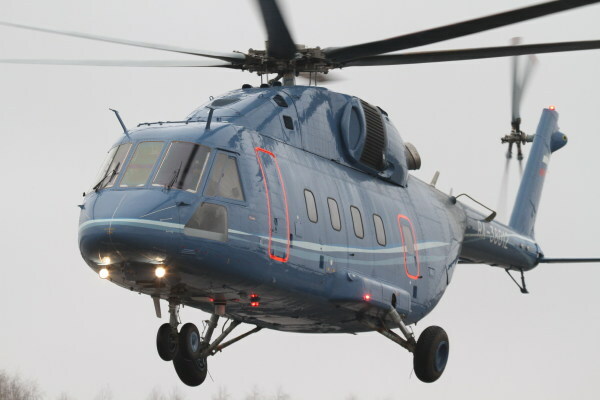 KAZAN --- OP-2, the second prototype of the new Mi-38 helicopter built by Moscow Mil Helicopter Plant JSC and Kazan Helicopters JSC, the subsidiaries of the Russian Helicopters holding company, has achieved its first flight. The test program that was started is proceeding well according to Kazan Helicopters specialists: the helicopter has already completed 26 ground runups and 7 hover and low speed flights over the runway. The design of the machine undergoing flight tests was modified pursuant to the results of tests on the first Mi-38 prototype – the OP-1. The hydraulic and fuel systems have been upgraded and some changes have been made to the main rotor blades. The helicopter control system now has spring feel mechanisms of type design. As a result the helicopter is in maximum compliance with the Russian airworthiness regulations AP-29, a counterpart of FAR-29. Its handling and stability have improved. It is equipped with Pratt & Whitney Canada PW 127/TS engines and the modern Tranzas IBKV-38 avionics suite with a glass cockpit. The helicopter can also be equipped with Russian TV7-117V engines. The Mi-38 OP-2 is scheduled to be handed over to Moscow Mil Helicopter Plant for the full flight test cycle. Moscow Mil Helicopter Plant is planning to demonstrate the Mi-38 OP-2 helicopter in 2011. Mass production at Kazan Helicopters is scheduled for 2013. The third prototype of the Mi-38 is in assembly in Kazan. The medium multi-role cargo and transport Mi-38 is designed for passenger transportation (including VIP flights), carrying loads in the cabin and on an external sling, search and rescue, offshore, and flying hospital operations. According to design specifications, the Mi-38 will have a high payload and top speed. The Mi-38 will have a spacious passenger cabin and highly efficient engines. The labour constant for service and maintenance may be reduced thanks to a built-in automated equipment and engine serviceability control system. The Mi-38 is a new generation helicopter that can perform up to the highest safety and comfort standards for helicopters in its class. Kazan Helicopters, JSC manufactures the famous Mi-8/Mi-17 helicopter family, operated in 80 countries worldwide and featuring a wide variety of modifications: cargo, passenger, medevac, rescue, troop-carrying, and others. Ground is laid for the production of the Mi-38. The company was certified to design helicopters in 1997: the light twin-engine Ansat is currently in production. Mil Moscow Helicopter Plant designs helicopters, tests prototypes, sees them through to production and certification. Upgrades and modifies existing helicopter types. The Plant is currently working on prospective designs such as the high-speed helicopter; taking part in the Russian Helicopters program for renewing the mass production of the Mi-34; completing tests of the Mi-28NE and the Mi-38; modernising the Mi-2, Mi-8/17, Mi-24/25, and Mi-26. Mi helicopters are built at aviation plants in Arsenyev, Kazan, Rostov-on-Don, Ulan Ude. Russian Helicopters, JSC is an affiliated company of UIC Oboronprom. It is the managing body of the following helicopter industry enterprises: Mil Moscow Helicopter Plant, Kamov, Ulan-Ude Aviation Plant, Kazan Helicopters, Rostvertol, Progress named after N.I. Sazykin, Arsenyev Aviation Company, Kumertau Aviation Production Enterprise, Vpered Moscow Machine-Building Plant, Stupino Machine Production Plant, Reductor-PM , Novosibirsk Aircraft Repairing Plant, Helicopter Service Company, and service centres.